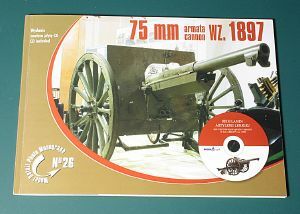 26th book in Rossagraph "Model Detail Photo Monograph" covers in great detail the French 75 mm cannon model 1897. The cannon has very important place in the history of light artillery. It was the first quick firing field cannon using long tube recoil principle and was used with great success by French Army during WW1. It was still used by French and other armies, among them Polish, during the WW2. Actually it was one of the most important light artillery pieces in Polish Army when Third Reich invaded Poland in September 1939 with over 1200 cannons used by Light Infantry Regiments of Polish Infantry Divisions. The soft cover book is a bi-lingual release with al the text printed in both Polish and English. It contains 56 pages, 155 mm x 215 mm size. Included with the book is also a CD-ROM disc with a copy of Polish Army manual from 1936: "Light Infantry Regulations, description and maintenance of equipment and ammunition of 75mm cannon model 1897". The manual is in 'pdf' format (free Acrobat Reader required to access the file is not included) and is in its original form, i.e. in Polish version only, but illustrations in it are quite useful even for readers not knowing the language. The only negative comment about the manual included is that no attempt was made to put the text through the OCR (optical character recognition) software, so all the text is in fact presented as graphics and it is impossible to use search facility of Acrobat software, and finding required information may be time consuming. The book starts with a table containing detailed cannon specifications (on the back side of front cover) and a short paragraph with history of the weapon and its use by Polish Army. On ten following pages are historical black & white photos of the cannon in French and Polish Army service. Next seven pages contain drawings of cannon and associated equipment in firing and travel configurations. These drawings come from the manual included on the CD. On following pages are photos of a well preserved Model 1897 cannon from the Polish Armed Forces Museum in Warsaw. Included are 40 black and white and 39 color photographs showing both general views and a large number of detail close-ups. In between these photos interspersed are 10 diagrams of various parts and subassemblies of the weapon, all from original Polish Army manual. Pictures are accompanied by captions in two languages. 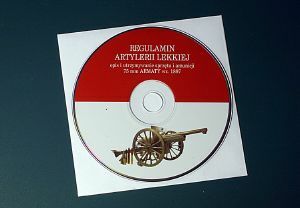 The CD with Polish Army manual. First pages contain specifications table and a history of the weapon. Historical photos of the cannon in Polish and French armies. Drawings from the technical manual. Very high quality detail photos fill the book. Detail photos and drawing from the technical manual. Both color and black & white pictures are of very high quality, as is the paper on which they are printed. Print quality is also superb. The photos show the cannon it smallest details and everyone considering building a scale replica of this gun should be fully satisfied with the contents of the book. The book is highly recommended to all people interested in Polish and French Army equipment, artillery in general, both WW1 and early WW2 artillery in particular and of course to modelers. As far as I know there is no plastic model kit of the 75 mm model 1879 cannon available, but 1/35 scale resin kit is made by Des Model company and 1/72 kits are available among others from Al.By (resin) and SHQ (white metal).